Over the years, the average person can accumulate a lot of stuff. And no, I'm not talking about an overflowing attic, more crap in the mail than any postman would know what to do with, or a garage so jammed with junk from years past that you can't even get a car into it. I'm talking about your workout program. Perhaps you started with a basic bodybuilding program that did its job. But over the years, you discovered some advanced exercises and techniques you just couldn't do without, and then you reorganized your split to handle even more volume. In no time, your streamlined 45-minute sessions grew to 60 minutes or more, crammed to the rafters with both new and old favorites as well as growth-inducing additions like supersets and triple drops, plus nearly every new machine that's been rolled into your health club. If this sounds like you, consider this your intervention. It's time to clear the clutter—all of it—and start anew. 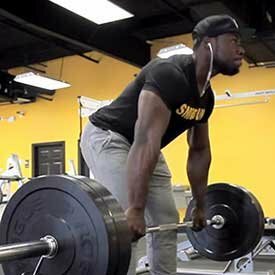 For the next few workouts to the next few months, consider putting aside your current regimen for this simplified power-building workout, which borrows elements of Olympic lifting to create a synergistic full-body approach to training. 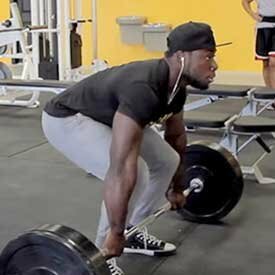 "This is a shock to the system," says fitness model, martial artist, and Team Bodybuilding.com athlete Kizzito Ejam. "I use it as a reset when I want to restructure the way I do things. It's a change-up for those times when I've been really focused on bodybuilding and the isolation movements that come with that." 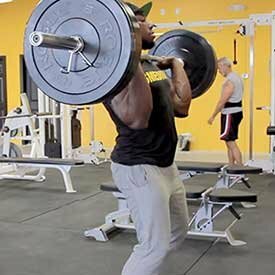 While Ejam's program entails doing four complex movements consecutively—which he has the strength and conditioning to do—for everyone else, it's recommended that you split your workouts into practicing each pair of movements twice per week. That adds up to four training sessions each week, with three rest days interspersed. Implement this protocol for a couple of weeks before you reestablish your training goal. Designed to Provide Intense Energy, Extreme Pumps, & Increased Work Capacity.Go Now! Each of these movements recruits a large degree of muscle mass. 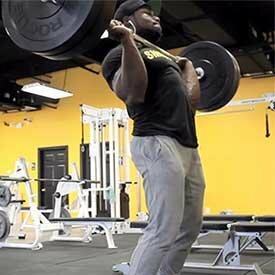 In fact, there's hardly a muscle on your body that's not utilized doing these lifts. Actively moving your entire body against resistance is a great way to increase power and athleticism. It's also a great way to challenge your body to move as a unit instead of only moving a single joint at a time. If you've never done a clean and jerk before, Ejam suggests practicing with a training bar or PVC pipe before tackling heavier loads. You'll perform 5 sets of each movement using weight close to your 7-rep max (7RM). If you don't know your 7RM, use a calculator. Plug in the numbers you do know, and go from there. These lifts are not meant to be done to failure, so don't push for total exhaustion. Warm up properly before doing your working sets, and take fairly lengthy rest intervals to ensure you're completely recovered before starting your next one. 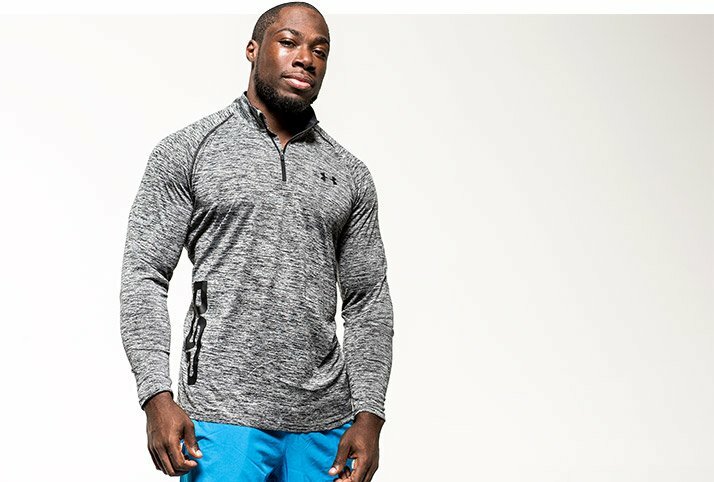 "I did cleans back in high school, so I'm familiar with them, but I work with a coach at my gym to get the form right," Ejam says. 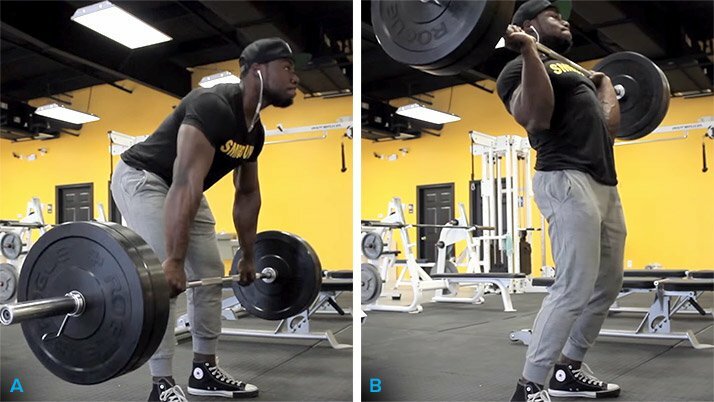 "Taking the barbell from the floor all the way up to shoulder level involves the quads, hamstrings, glutes, core, and upper body in an explosive way." 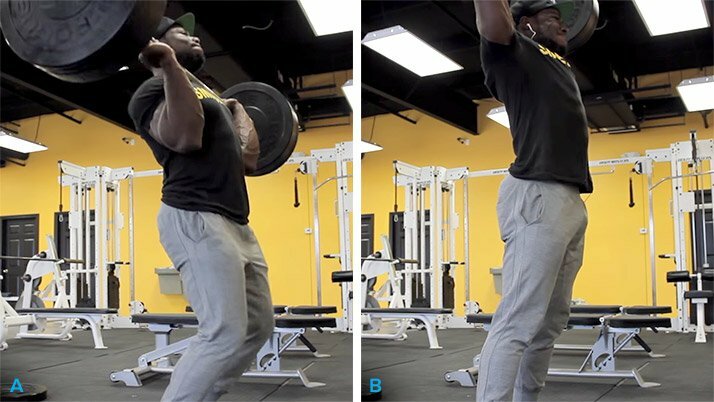 Form check: Begin with your feet shoulder-width apart and your shoulders over the bar. As you pull the bar off the floor, keep tension in your hamstrings and lats. When the bar reaches your pockets, extend your hips and shrug hard to pull your elbows under the bar. You should finish with the bar resting on your delts and your elbows facing the wall in front of you. 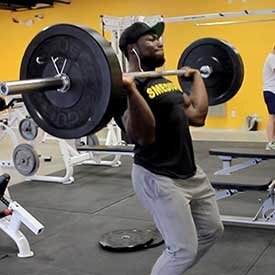 "Adjusting to the 'bounce' during push presses was difficult for me when I was learning this movement, because I was used to doing strict standing military presses," Ejam recalls. "But you have to force yourself to do it right, and generate momentum from your hips and knees to drive more weight up." Form check: Stand with your feet shoulder-width apart and the bar resting on your delts. Bend your knees about three inches, then explode upward, pushing the bar over your head. Finish with your arms completely extended and your ears in front of your shoulders. 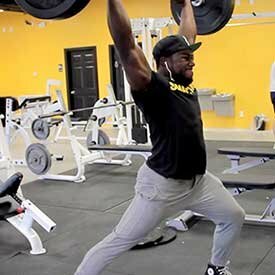 "With hang cleans, you're moving the weight between knee level and shoulder level, so it's a shorter range of motion than the power clean," Ejam explains. 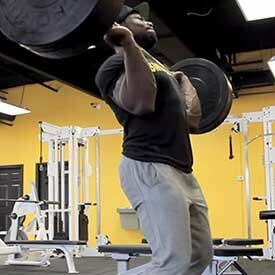 Form check: Begin by holding the bar right below or right above the knee. Your lats and hamstrings should be tense. Try to keep your chest and shoulders over the bar as you extend your hips to pull the bar up. When the bar reaches your pockets (or just below your hips), fire your glutes to extend your hips and shrug your shoulders. Pull yourself under the bar by bending your knees and swinging your elbows forward. Catch the bar in a squat, then stand up. 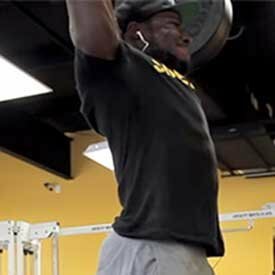 "Like push presses, you start with the weight at shoulder level," Ejam says. 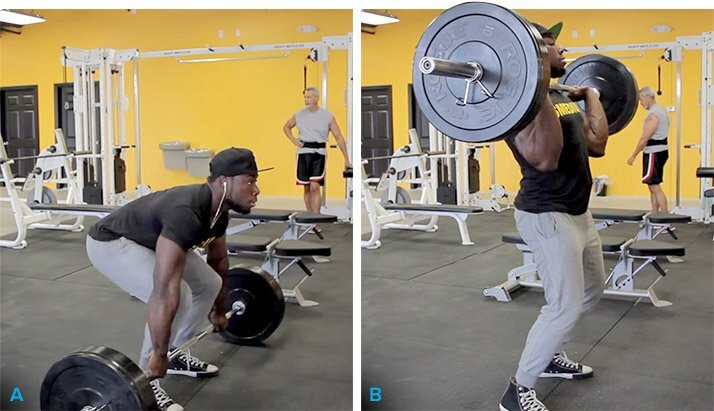 "Split jerks help with stability. The finishing stance is what's called a 'front stance' in martial arts, where you lower your center of gravity closer to the floor so you're harder to knock down." Form Check: Stand with your feet shoulder-width apart and the bar resting on your delts. 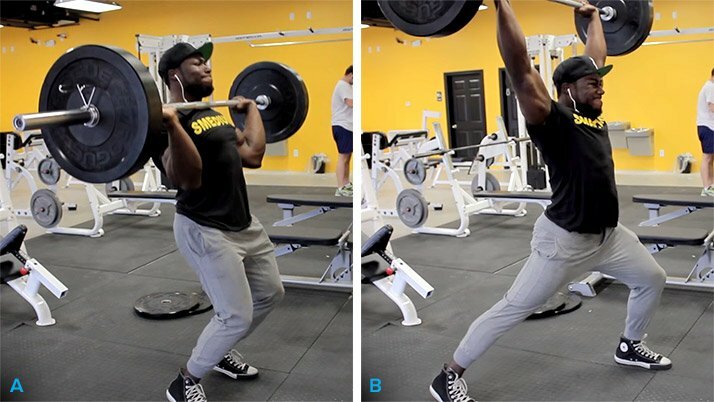 Bend your knees about three inches, and explode upward with the bar. As the bar moves up, split your legs to move under the weight as it comes back down. Keep the bar over your head, and stand back up by moving your front foot back and then your back foot forward.